Growing up in Canada, Easter consisted of waking up, grabbing our colourful baskets and setting off to scour the backyard for plastic eggs filled with jellybeans and chocolates! The commercials on TV always had a cute, furry bunny hopping around, and the malls were filled with eggs and bunnies in candy form. When we moved out to live on our own, we thought of Easter as a long weekend, giving us an extra day off of work, and an extra night to party at the bar! We had always wondered how/why bunnies and eggs were associated with this religious time…and to be honest, we only recently found out. The idea of an Easter Bunny (or Easter Hare/Easter Rabbit), originated among German Lutherans in the 1600s. Similar to Santa, the rabbit would judge whether children were good or bad, and based on that, whether or not they would receive any gifts. It was a common belief that hares were hermaphrodites, meaning that they could reproduce without losing their virginity! It was this thought that led to an association with the Virgin Mary, tying rabbits with the church. There are many reasons why eggs are associated with Easter. Christians tie eggs to rebirth, as Jesus rose from the grave, and many people paint eggs the colour red to represent the blood shed during the crucifixion of Christ. For us, this year’s Easter was the most incredible one yet. It wasn’t filled with chocolate and candy, it was more of a religious affair. 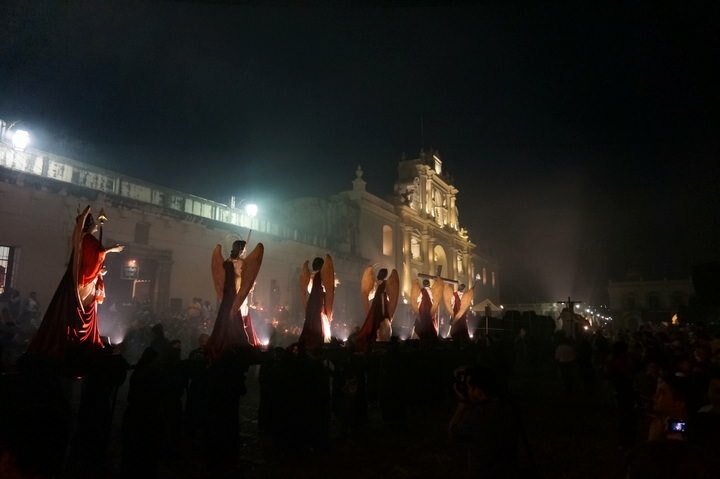 Along with Seville in Spain, the city of Antigua, Guatemala celebrates this time of year with gusto! Since we are living on Lake Atitlan, just 2.5 hours away from the city, we figured we had to go and experience the Holy Week celebration, also known as Semana Santa. We had missed the Good Friday processions, but that didn’t matter, we were still in time to see the floats and celebrations in honour of the Virgin Mary. 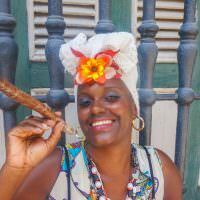 The streets were busy and buzzing with locals and tourists alike – everyone interested in this fantastic spectacle. 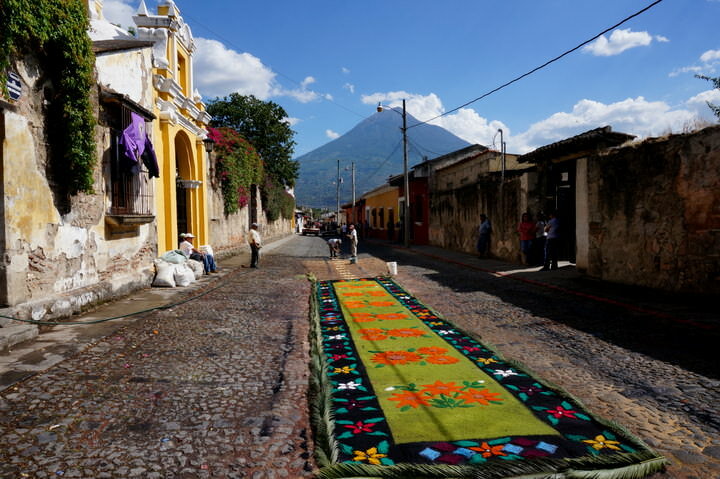 Colourful carpets (alfombras) created by families adorned the cobblestone streets along the procession routes. These intricate designs are unique to each household and are made from coloured sawdust, flower petals, pine needles and sand. Families spend hours, or even days, creating these carpets, only to have them trampled by the processions that pass by. When we were watching, we noticed that the artwork went untouched by the band members and incense bearers, only those who were carrying the floats (andas) depicting Jesus Christ and the Virgin Mary walked over these masterpieces. As the processions moved slowly along the street from the late afternoon into the evening, we couldn’t help but be mesmerized by the banging of the drums, the hypnotic footwork of those carrying the floats and the intoxicating scent of the incense burning throughout the streets. Have you ever experienced any religious celebrations like this before?! Where? Cool, looks like a really awesome happening! 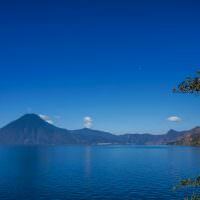 Would love to visit Guatemala some day. So glad you get to see some of the Semana Santa celebrations in Antigua – it truly is an incredible experience and one of my lasting memories from Latin America as I’ve been lucky enough to see it twice. If you wander the streets at night, before the processions, there really is a wonderful vibe in the air with families and neighbours all coming together to make the carpets into the wee hours. Magic! 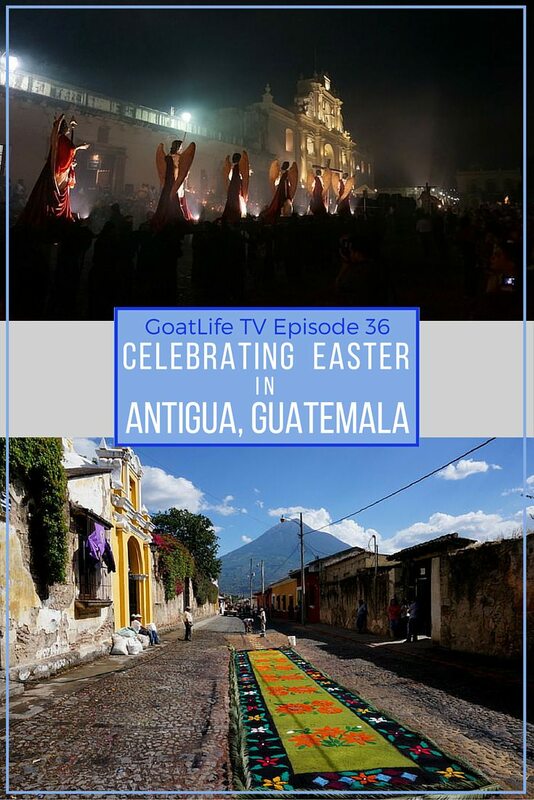 Very interesting to learn how they celebrate easter in Guatemala. I love your blog guys!